Are you looking for a way for yourself or your organization to thrive, while stimulating and catalyzing a society that meets everyone’s needs (within your circle of influence) and that also stays within the limits of our planet? Doing good for yourself, with your organization, for the other and for the planet is not an easy task nowadays. Let alone transforming your current life or organization to one that’s doing just that. I accompany and support entrepreneurial people and/or their organizations on this path, helping you to start positively impacting your own life, your organization and everythings that’s connected in some way. All while catalyzing a society that meets the needs of all within the means of our planet. Thrive yourself or with your organization while catalyzing a society that meets the needs of your circle of influence and stays within the means of our planet at the same time. This is about living a happy, meaningful life and start doing the things that are right for your personal life, in your career, within your organization, the other and also right for the planet. Ensure that no one within your circle of influence falls short on life’s essentials (from food and housing to healthcare and social justice). This is about how you treat and take care of yourself and others: your family, your relationships, your employees and so on. It’s also about what you buy and where you buy it. 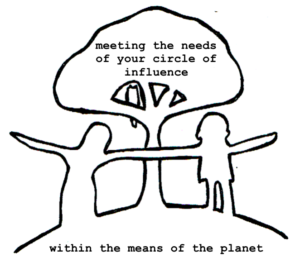 Your circle of influence may be larger than you think! Ensuring that collectively we do not overshoot our pressure on Earth’s life-supporting systems, on which we fundamentally depend – such as a stable climate, fertile soils, and a protective ozone layer. This is about reducing your (organization’s) footprint, your contribution to reduce global warming. If you’re wondering what’s the right thing to do in today’s complex world with so many things to be confused or frustrated about and you think you can use some support and a listening ear: let’s connect and start the conversation. I can help you transform your own life taking all relevant aspects of your life into account. I’ll provide guidance, practices and support based on your needs. We can meet in person if you’re within reasonable reach from Roermond which is in the south of The Netherlands or else via (video-)call. If you are looking for someone to help your organization on this path: let’s connect and find out if there is a match. This will be about the what and how of your organization and your organization’s contribution to society. I’ll support the strategy setting and the planning and coaching of the execution.